73732666 Elbow bone fracture. Female having pain in injured arm. 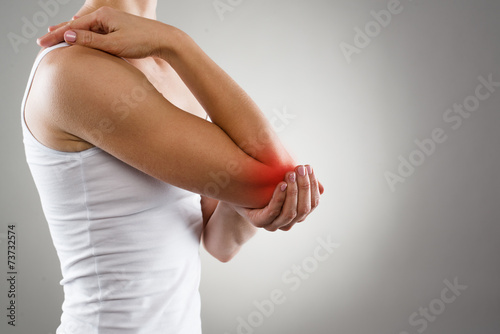 73774919 Female with elbow pain. Osteoarthritis or joint gout concept. 73774750 Young girl having hurt elbow. Bone dislocation concept. 102333878 Elbow injury. Sprain. Muscles tension on female hand. 66009135 Young woman suffering from elbow pain or injury. 102422351 Back rehabilitation. Young female exercising her muscles after trauma. Health care and medicine. 73829831 Chronic osteoarthritis. Woman exercising her painful wrist. 73681892 Injured female legs with red spots. Muscle strain and stretch. 73681759 Woman's leg calves over grey. Muscular hurt concept.